Our Amish handcrafted toy chests feature pinch free front panels. On all our Amish toy chests we use counterbalanced lid supports which are approved by the Consumer Product Safety Commission. This will prevent accidental falling of the chest lid and pinching of little and big fingers. 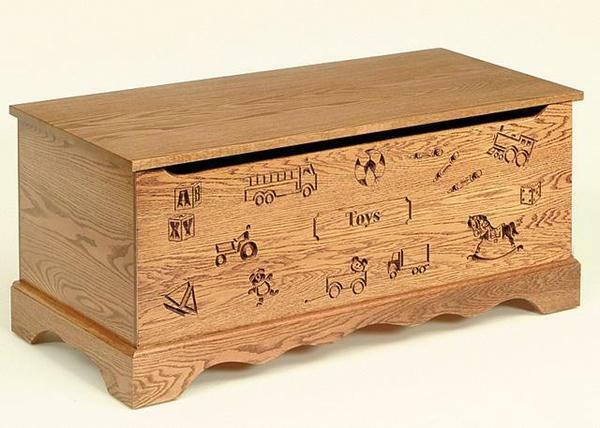 This toy chest is crafted in solid wood wood and can be personalized with your child's name or can say toys. This chest measures 42½” long by 19” wide and 19” high and offers 5.2 cu. ft. of storage for plenty of toys and games!